When you're getting married, picking out stuff for your registry should be the fun part. (It's like shopping, but without the money!) But figuring out what you're going to ask people to give you is actually really confusing and stressful. Like, are you really going to use a pasta maker more than once? How many forks is too many forks? Do you really need a fireside popcorn popper? DO WE EVEN WANT TO GET MARRIED AT ALL? Jesus. First, select your living situation. And how many people you tend to have over. 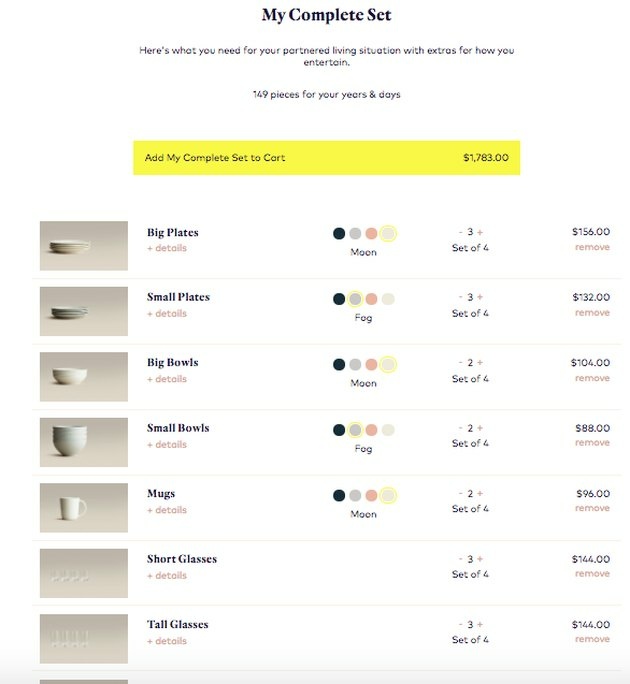 Then, you select your desired color (or there are color combo options available; we chose midnight blue and pink), and it outlines everything you need to create a set suited to your needs, which will include dishes as well as glassware, flatware, and serving pieces. The total price it gave us for a couple who is an "enthusiast" who entertains for up to 12 people seemed high at first — $1,783 — but we realized you could subtract items that you might not need. 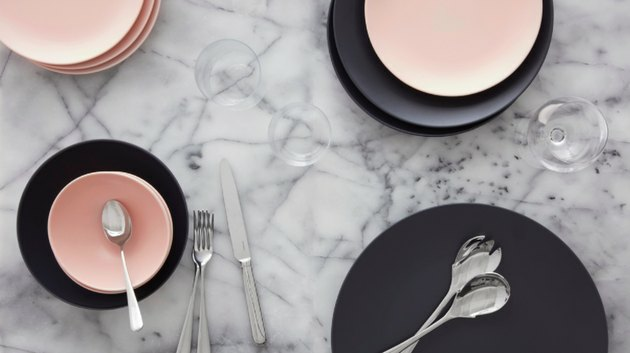 By taking off the glassware and flatware, the price dropped down to $730, which really is quite affordable for a set that still includes over 50 pieces. Cool, right? Our recommendation: Get set up on Zola or MyRegistry, which allow you to add goods from any online store to your registry. Also, obviously, you don't need to be getting married or moving in for any of this, because, hello — these dishes are gorgeous and budget-friendly and perfect for anyone. Just saying that they make figuring out stuff super easy, regardless of your situation.